The old bimini is learning new tricks. It isn&apos;t giving up its customary job of dispensing shade, but starting this fall a new version will also have solar panels stitched to the weather side to produce electrical energy from sunlight. Call it the yin and the yang of canvas. Although rooftops of buildings have been used for solar power for decades, boats - especially sailboats - have been difficult to adapt. A lack of level deck space and shading problems caused by rig and sails drove owners into expensive and ungainly solutions or forced them to make do with less efficiency. Led by Lagoon, the world&apos;s largest manufacturer of cruising catamarans, three French companies set out to remove some of these limitations by attaching photovoltaic panels to canvas, thus making solar power - at least in theory - accessible to any boat that can accommodate a bimini or T-top. Lagoon cooperated on the project with Dickson, a French high-tech canvas maker and a subsidiary of U.S.-based Glen Raven (Sunbrella), and Nv Equipment, a canvas manufacturer specializing in boat protection. The photovoltaic bimini was scheduled to make its debut in September at the Cannes International Boat and Yacht Show aboard the 62-foot Lagoon 620. Solar panels consist of photovoltaic cells made from thin silicon wafers, which have a positive and a negative charge. Exposure to the sun creates electron activity that is captured by a grid of fine contacts, which are channeled through a junction box and create direct current power. 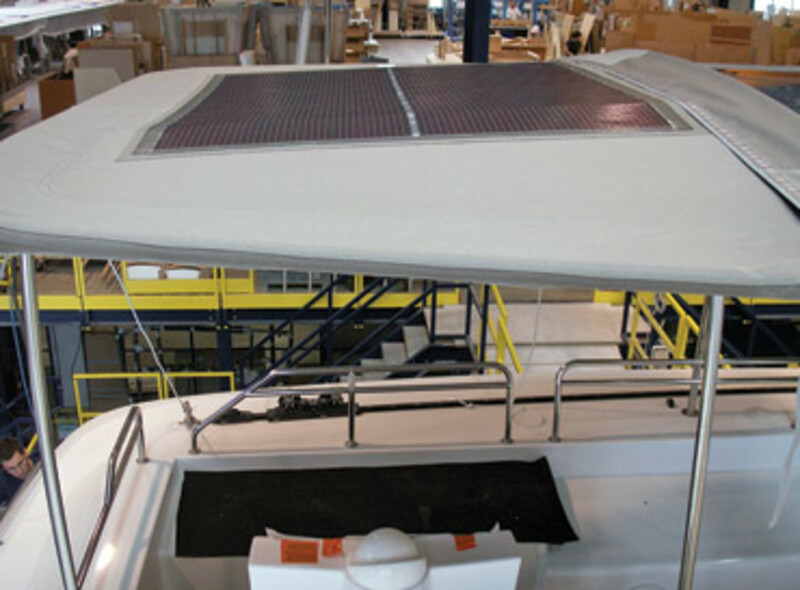 Thin-film panels, such as those on Lagoon&apos;s bimini, use a thin layer of silicon. That keeps the panels flexible, but also less efficient than the hard and heavy mono- and polycrystalline panels found on buildings. Thin-film panels have been popular for years because they are portable and can be rolled up for storage. They have been used on solar backpacks and by power-hungry people who want to charge their electronic gadgets even when they are off the grid. 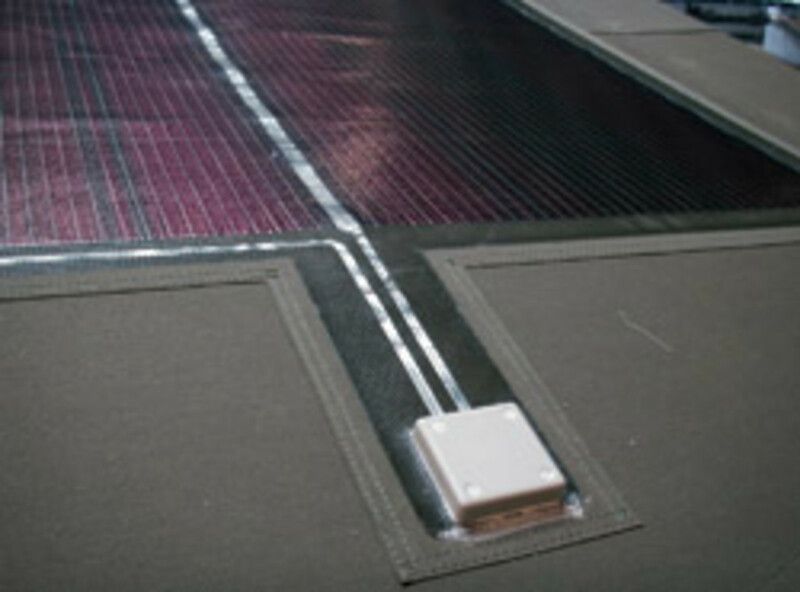 On boats, these thin-film solar panels are used for trickle-charging the batteries while docked or moored. But unlike roll-up panels, which usually disappear in the cockpit locker when the boat heads out, bimini panels are up and out of the way, constantly exposed to sun and also operating under way. 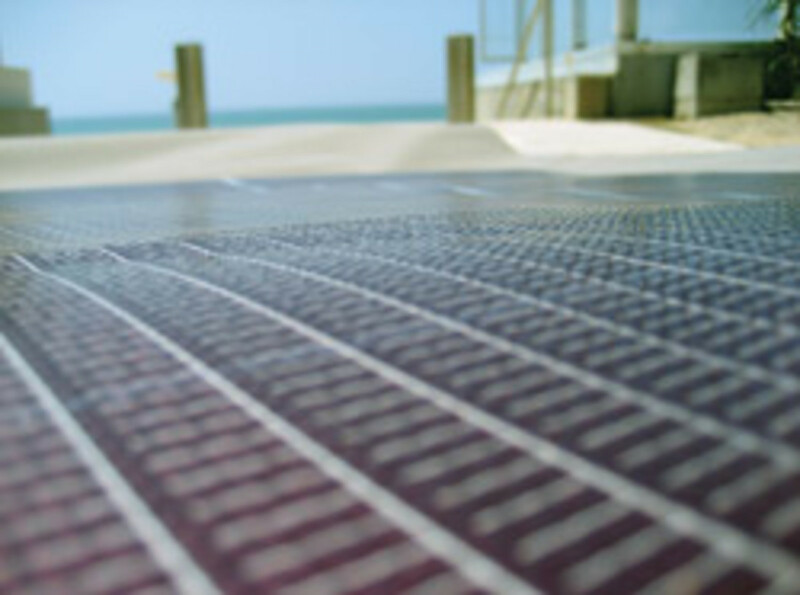 After three years of research, Dickson came up with a "solar cloth" that uses thin-layer cell technology with silicon pulverization that incorporates photovoltaic capabilities with marine Sunbrella Plus fabric. Initially, the Lagoon bimini top has two panels of 10.75 square feet that produce 50 watts each (plus or minus 5 percent), which adds up to approximately 100 watts of total capacity. A junction box is also attached to the panel. Exact numbers on electric output were not immediately available because the product was still undergoing sea trials. The company says the PV fabric weighs about two pounds per 11 square feet and has to be installed with sturdy hollow tubing, which acts as a conduit for the wires that connect the panels to the vessel&apos;s electric system. Caring for a PV bimini top isn&apos;t much different from a regular one, says Laure Martin of Nv Equipment&apos;s marketing department: "Do not walk on cells, and when you need to take off the canvas, it has to be rolled and not folded." Although the product will be shown on Lagoon catamarans first, Nv Equipment says production will start in earnest after the trial results are in and the market begins to show demand. The company estimates that a commercial rollout will follow in 2011 and indicates that it could make the product available for other types of biminis and to retrofit existing tops, although no decisions have been made. Also under consideration are licensing agreements with other manufacturers. Lagoon uses low-emission and clean-energy technology as a branding tool and to promote sailing as a clean activity. The irony, however, is that powerboats are far better suited for solar panels because they don&apos;t have tall masts, sails and rigging that produce shade - the nemesis of photovoltaic power. Cruisers who rely on solar systems often use unattractive stainless-steel arches on the stern to keep these panels out of the cockpit and the rig&apos;s shading area. Although some panels claim to be shade-tolerant, the common wisdom is that even partial shading substantially reduces charging capacity. "If one quarter of the panel cell area is shaded, the juice being cranked out will be virtually nil," the Green Living Tips blog says. That&apos;s because on standard panels all cells are linked, so if one is shaded, production drops across the board. Lagoon spokeswoman Cécile Wittmann says, however, "The system will continue to work in the shade, even if it produces less [energy]. Probably, like any other solar panels on sailing yachts, the boat may lose efficiency, depending on how it is oriented, but tests will give us more information about [performance]." Incorporating biminis or T-tops, which are found on many boats, adds a new dimension to the renewable energy game. Although they won&apos;t produce enough power to carry big house loads, they can help keep cell phones, music players and on-board electronics powered up and trickle-charge the battery while on a mooring so it always has enough juice to run the bilge pumps or cabin fans. And that does not count the benefits of reducing carbon emissions and fuel consumption.